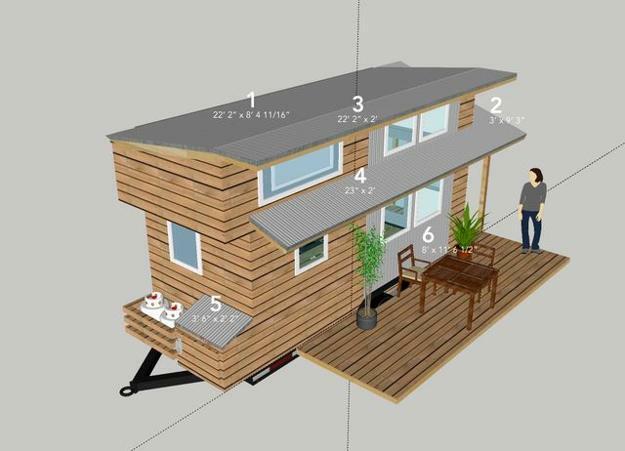 This wooden summer house design features an attractive exterior, cozy and modern interiors, Green building materials, eco friendly systems and convenient wheels that allow to travel in style. 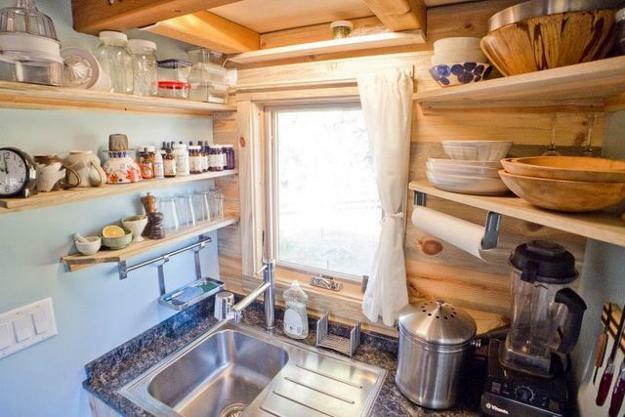 The small home on wheels is called The Tiny Project. 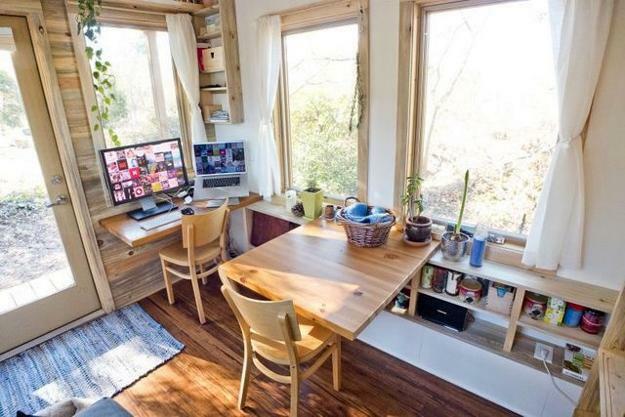 Lushome brings this unique design project, created by American web-designer Alek Lisefski, to its reader to demonstrate this creative and interesting building idea for Green living. 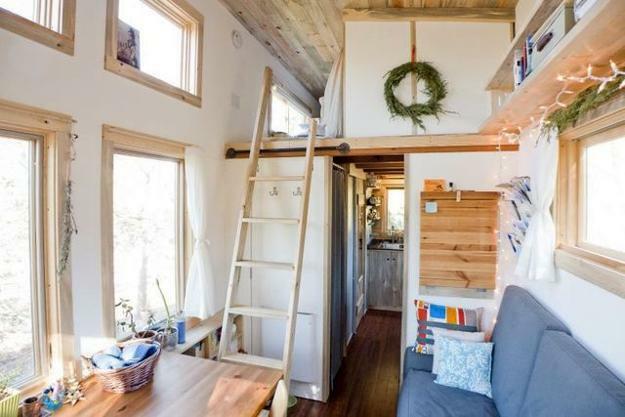 The handmade small house looks amazing, offering great inspirations for all who appreciate comfort and simplicity of Green living, and like to travel in style. The designer developed the house layout plan and prepared drawings for building the attractive, inviting and beautiful wooden home. 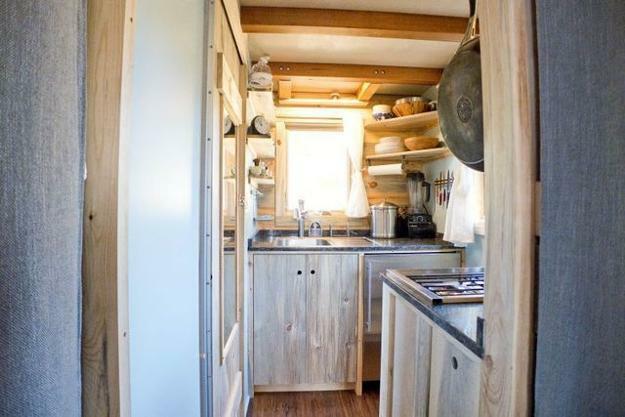 The small building is 6 m long , 2.4 m wide and 3.5 m high and has everything you need for a comfortable life for two people who love to travel in style. 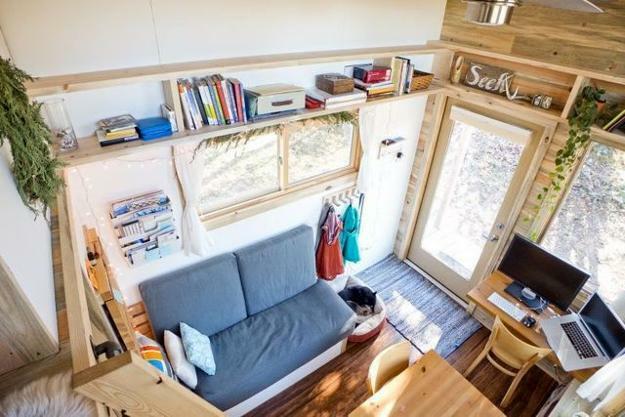 This wooden trailer offers very cozy, bright and unique home interiors with large windows and features contemporary exterior design. Two inclined roofs add charming details to its structure. 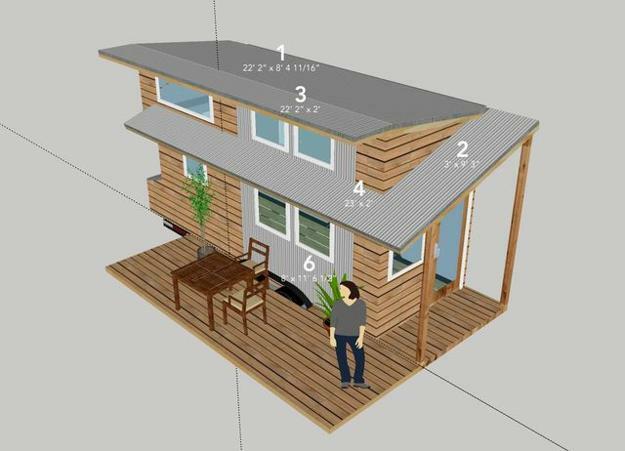 The front porch and deck enhance house design, stretching home interiors and blending them with outdoors. 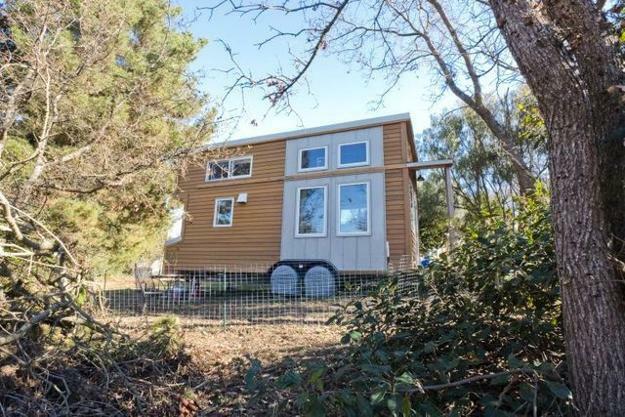 This mobile and pleasant home is an excellent solution for traveling on wheels in summer and enjoying beautiful surroundings. Modern interiors are built with wood and decorated with bright accents. Comfortable brown colors of natural wood create pleasant and harmonious palette with flax and green colors. Glass doors and window designs in various sizes bring lots of natural light inside, creating visually spacious, light and bright living spaces. 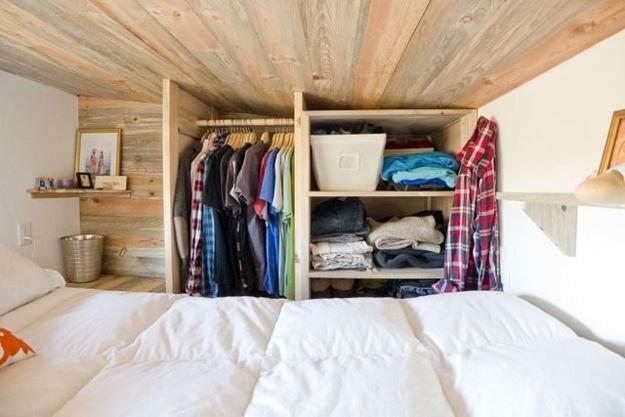 Modern interior design features convenient storage shelves and cabinets that allow to create well-organized and functional rooms while maximizing small spaces. 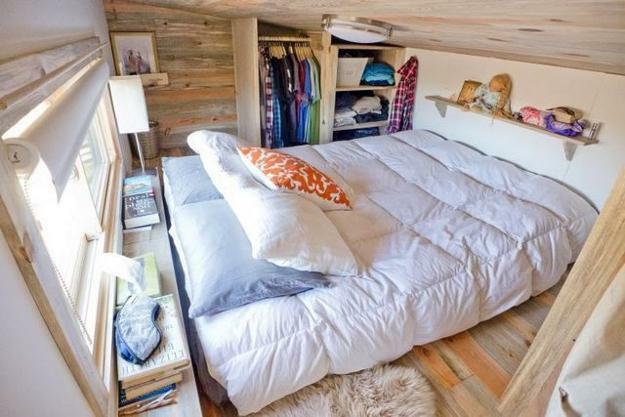 Smart, cozy and compact interior design provide beautiful and airy living areas. 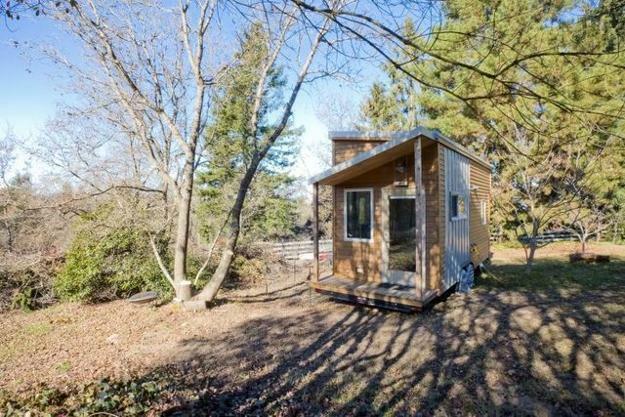 The small house design has living room, working and dining areas, bookshelves and storage systems for books and kitchen items. 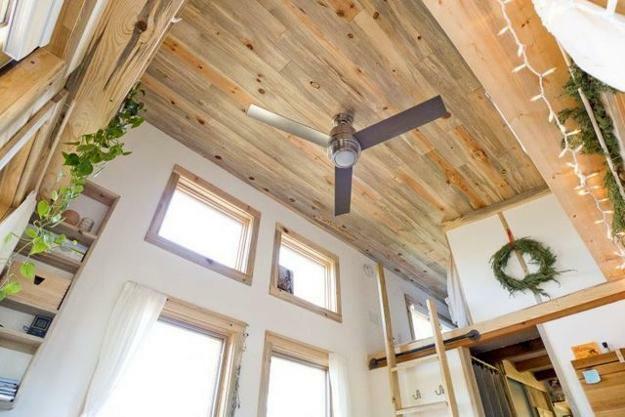 High ceiling allows the owner to build the bedroom under the ceiling and add a fan for creating more comfortable, cool and pleasant atmosphere in hot summer. The sleeping area with a large bed is located on the second level of the house. 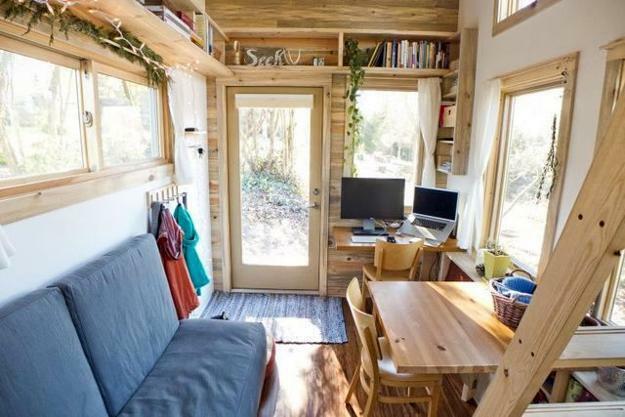 The bedroom has a window, storage spaces and shelves. 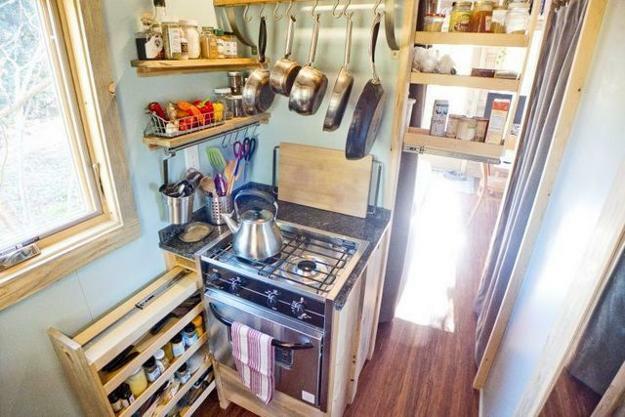 The kitchen area is well equipped with all appliances, – stove, fridge and washer. Kitchen storage shelves and cabinets drawers make the interior look organized and comfortable to use. 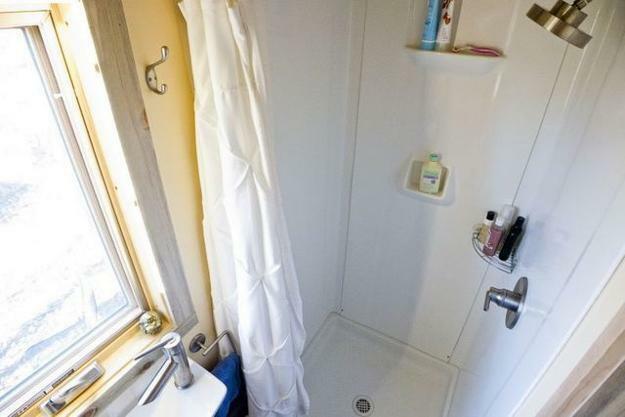 The bathroom is located under the sleeping area. 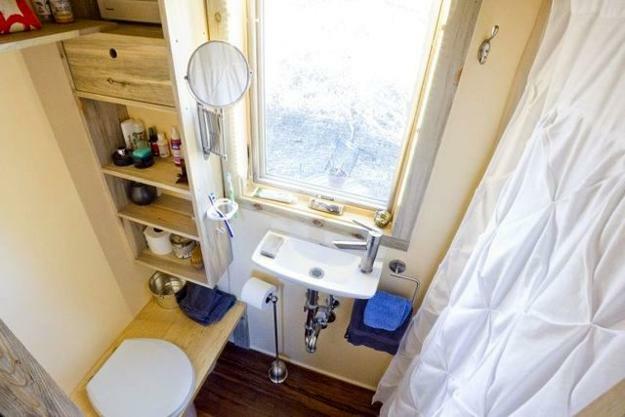 The small, but functional bathroom design has everything you need for simple and comfortable summer lifestyle. The modern house design is enhanced by Green ideas, – Green building materials, eco friendly solar panels, recycling water and waste systems. 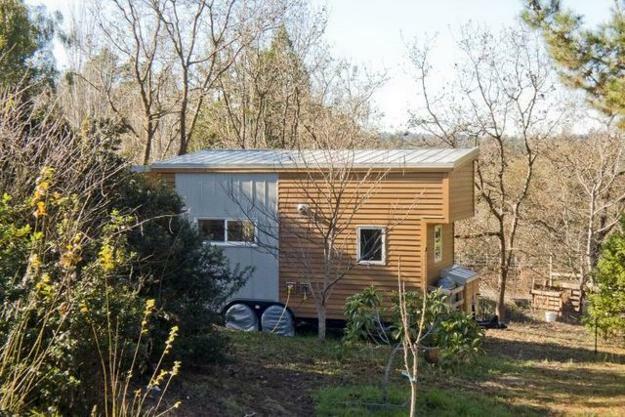 The Tiny Project is an example of very economical sustainable design, perfect for comfortable Green living.